1. 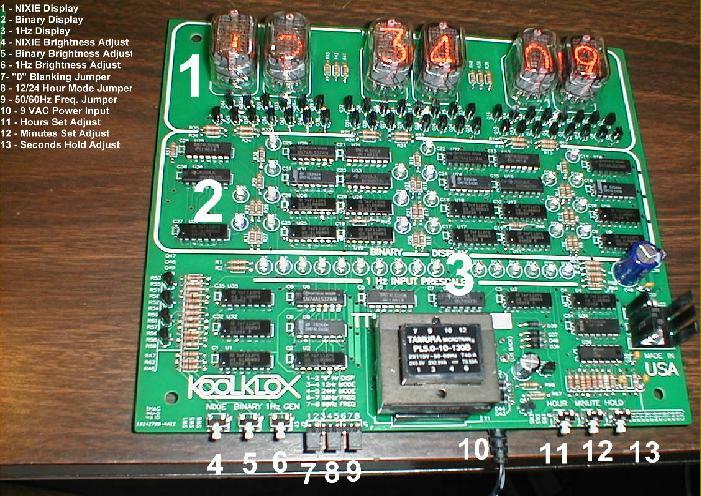 NIXIE DECIMAL DISPLAY - Utilizes Russian made IN12A neon NIXIE tubes to display time in conventional decimal format. 2. BINARY DISPLAY - Contains six vertical rows of soft glowing purple LED's used to display the time in binary format or "base 2" which is explained HERE. This section also contains the logic IC's to count seconds, minutes and hours. 3. 1Hz INPUT PRESCALER - This is a selectable divide by 50 or divide by 60 counter used to scale the line input frequency down to 1Hz (one cycle per second) to drive the main clock circuit. The output of this two stage counter is displayed as a moving "dot" on these soft glowing purple LED's. 4. NIXIE - This button sets the brightness level of the NIXIE tubes. 5. BINARY - This button sets the brightness level of the BINARY DISPLAY LED's. 7. "0" Hr DISP - This jumper is used to display or blank the "0" in the 10's Hours digit. Example: Jumper can be set to display "09:23:45" or "9:23:45". 8. 12/24 Hr MODE - This jumper sets the clock to display in 12 Hour or 24 Hour modes. 9. 50/60Hz FREQ - This jumper is used to select the incoming line frquency. Example: For operation in USA set to 60Hz, for Europe set to 50Hz. 10. AC POWER INPUT - Plug AC power plug in here. 11. HOUR - This button is used to set the Hours time. 12. MINUTE - This button is used to set the Minutes time. 13. HOLD - This button "freezes" the Seconds time for precise time setting.